Springfield School in Portsmouth, just along the south coast from our Southern Training Centre in Midhurst, has been an amazing supporter of our charity over the years. On Monday 17 December the Canine Partners team returned to the school for the annual session for year 8 pupils, which is a great opportunity to tell them who we are, what we do and how we train our amazing dogs. On this occasion, our volunteer speakers were joined by demonstration dog Tina with her human handler, also called Tina! The duo demonstrated the core skills of tug, touch and retrieve, much to the delight of the pupils. Tina was also able to demonstrate her Christmas dancing skills! We also were presented with a cheque for £250 as part of fundraising by the school, whose five houses also sponsor one of our amazing puppies each. Assistant Head Teacher, Mr Lomas and his wife, have become fosterers for the charity too, so a warm welcome to the purple family! Springfield is definitely a school that is keen to support Canine Partners and we are extremely grateful for their continued support. 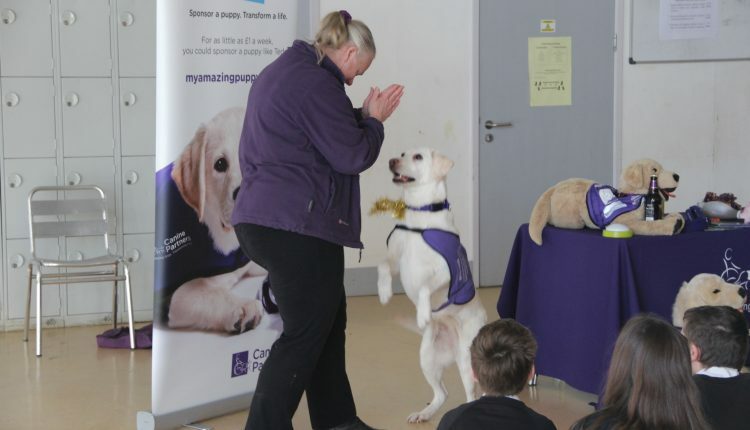 Is your school or organisation interested in supporting Canine Partners? We have a network of volunteer speakers who can give talks and presentations all across the UK. Book a speaker today.